On the 28th of December 2018, a bronze girl-statue entitled, “Monument for Peace and Women’s Empowerment” was erected in an elderly home in the city of San Pedro, Laguna Province in the Philippines. However, on the 30th of December 2018, the statue was removed after representations were made by the Embassy of Japan in the Philippines to the Presidential Office of the Philippines and the Ministry of Foreign Affairs, claiming “we are extremely disappointed (in the installment) as it is not compatible with the Japanese government” (Manila Shimbun, Jan 2 2019). We resent and strongly protest this repeated act of interference by the government of Japan, the perpetrator state who sexually enslaved women throughout the Asia-Pacific. 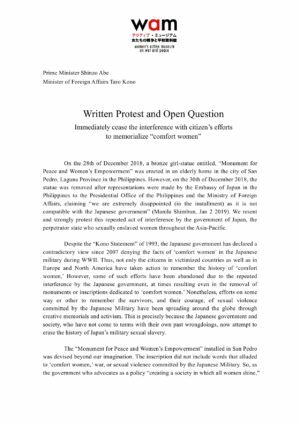 Despite the “Kono Statement” of 1993, the Japanese government has declared a contradictory view since 2007 denying the facts of ‘comfort women’ in the Japanese military during WWII. Thus, not only the citizens in victimized countries as well as in Europe and North America have taken action to remember the history of ‘comfort women,’ However, some of such efforts have been abandoned due to the repeated interference by the Japanese government, at times resulting even in the removal of monuments or inscriptions dedicated to ‘comfort women.’ Nonetheless, efforts on some way or other to remember the survivors, and their courage, of sexual violence committed by the Japanese Military have been spreading around the globe through creative memorials and activism. This is precisely because the Japanese government and society, who have not come to terms with their own past wrongdoings, now attempt to erase the history of Japan’s military sexual slavery. The “Monument for Peace and Women’s Empowerment” installed in San Pedro was devised beyond our imagination. The inscription did not include words that alluded to ‘comfort women,’ war, or sexual violence committed by the Japanese Military. So, as the government who advocates as a policy “creating a society in which all women shine,” why is it that the Japanese government understood that the statue was “not compatible with the position of the government”? Could it be because it was built by the same sculptor of the statue in front of the Japanese Embassy in Seoul? Is this a valid reason for a government to raise a protest? In 2016, the Japanese government’s intensive efforts against the plan to install a similar monument in the German city of Freiburg led to the cancellation of the plan, bringing the government’s common sense into question. Afterwards, German citizens installed the monument on private property in the city of Wiesent, Bavaria. However, the Japanese government pressured the property owner, which resulted in the erasure of the inscription that accompanied the monument. It is undeniably abnormal to intimidate citizens to affect their actions conducted on private property. Is it due to the contents of the inscription, the location of the installation, who erected the monument, or are they disturbed once again by the fact that it was another replica of the same artwork? The ‘position’ of the Japanese government continues to be incomprehensible. 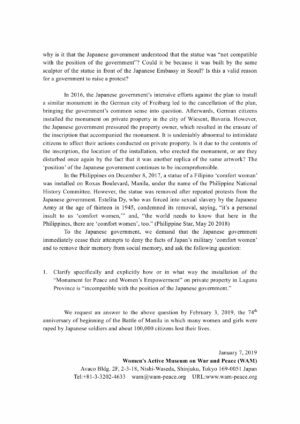 We request an answer to the above question by February 3, 2019, the 74th anniversary of beginning of the Battle of Manila in which many women and girls were raped by Japanese soldiers and about 100,000 citizens lost their lives. (C) 2019 アクティブ・ミュージアム 女たちの戦争と平和資料館（wam）. All rights reserved.